l Crisp kickback— Skeletonized stylish aluminum slide brings up the sensation. 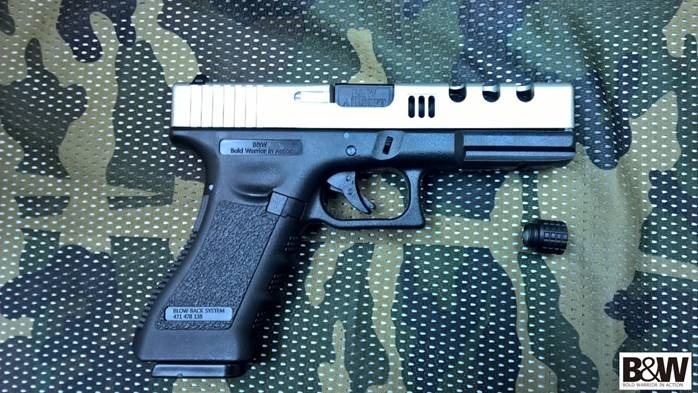 l Tactical fierce—Threaded outer barrel and removable tip adapted with a silencer(optional). l Rare and limited—1000 pcs. among 10 mixed styles within H and W models. l Instant support to front line—Ready to ship! Say good bye to delivery lead-time! 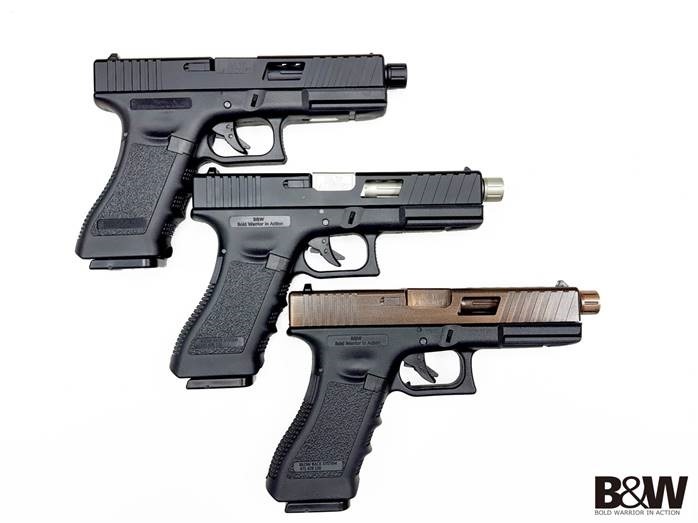 The BW17 custom gas pistols is the third generation from the standard BW17【GP917】,which has been awarded the training weapon of【Taiwan CQB】, a semi-official shooting club for M&P departments in Taiwan. The Advanced BW17【PBW-S17B】, the second generation equipped with Poseidon’s patented trajectory kits, has owned dozens of acknowledgements from global partners. TB version will sure win even more supports for the varieties of appearance. Type W can be easily identified by the stylish skeleton process “W” at the top of slide and windows at both sides. 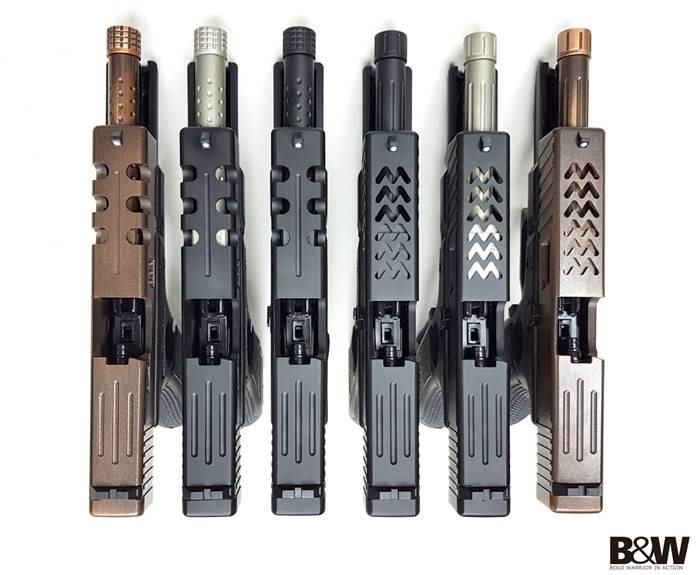 There are three colors of threaded outer barrels to be fitted with hollow traditional black slide-BK/SV/Golden. 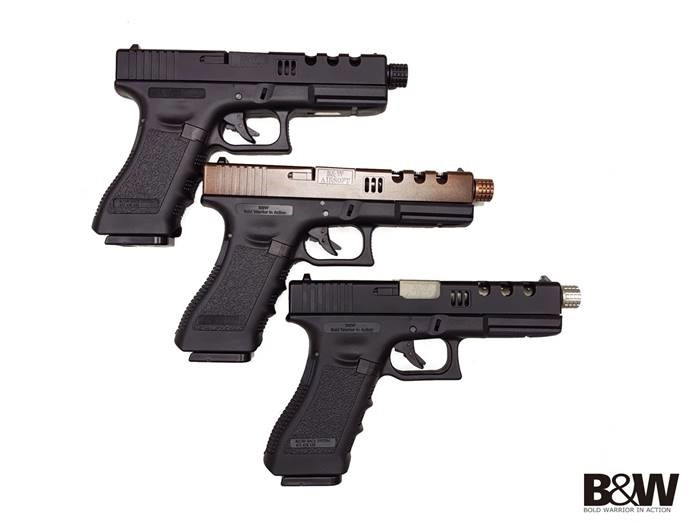 The rest two mean to show bold contrast – bronze rose model will have unique texture coating on aluminum slide; the other space silver slide hinds a satin black barrel, both sheds lights upon conflict elements in this G_17 replica. Type H is named after its 3 pairs of horizontal cuttings on the top and sides of slide. The layout of shark gills-like vents at both side of slide along with 6 oval cuttings reminds the classic design of Jeep Wrangler, a tough and fearless machine ready to accomplish any exploration. Same spirit can be found in B&W. The golden barrel of BW17TB, 【PBW-H17BG】,shows the distinguished and non-compromise attitude from gunners. The slim and simple line of 【PBW-H17SB】holds everyone’s breath under the tranquil of space silver slide. Please contact local B&W dealers, or sales@jiadyi.com to know more about the competitive price and reserve the exclusivity, because the finite is cruel.